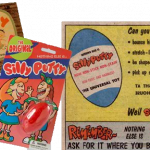 Remember Silly Putty? It was born as the high tech replacement for rubber during the shortage in WW II. What about Winky Dink? The first interactive TV program that asked kids to lay a sheet of acetate over their TV screens and draw Winky out of a jam. Yesterday’s toys are tomorrow’s innovation. Better graphics, better interaction, but is the play experience better, worse or just different?